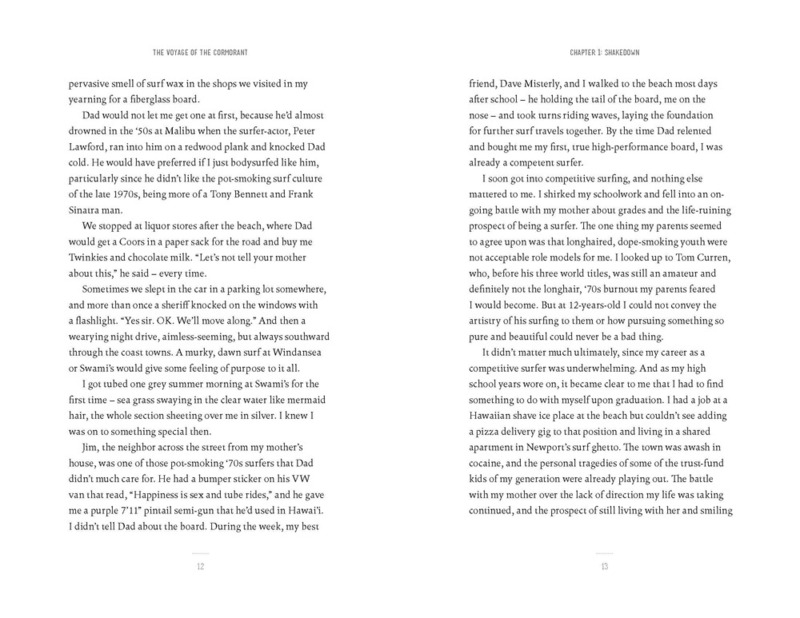 My book Voyage of the Cormorant (Patagonia Books, 2012) takes in the major themes of my writing life: people, places, and the sea. I trace the way these forces shape and inform one another in the book, and in the features I write for The Surfer’s Journal, as well as in the continuing volume I am writing, A Following Sea. In commercial work, I seek brands that have integrity, representing their products through authentic experiences with skilled photographers/filmers and athletes. My readings for Voyage have a spoken-word element, and I enjoy engaging audiences with adventure stories. Christian Beamish built a boat in his garage and set off to find surf along the coast of Baja. He tells of his adventures in Patagonia's The Voyage of the Cormorant and the reader finds out what happens when vision meets reality. 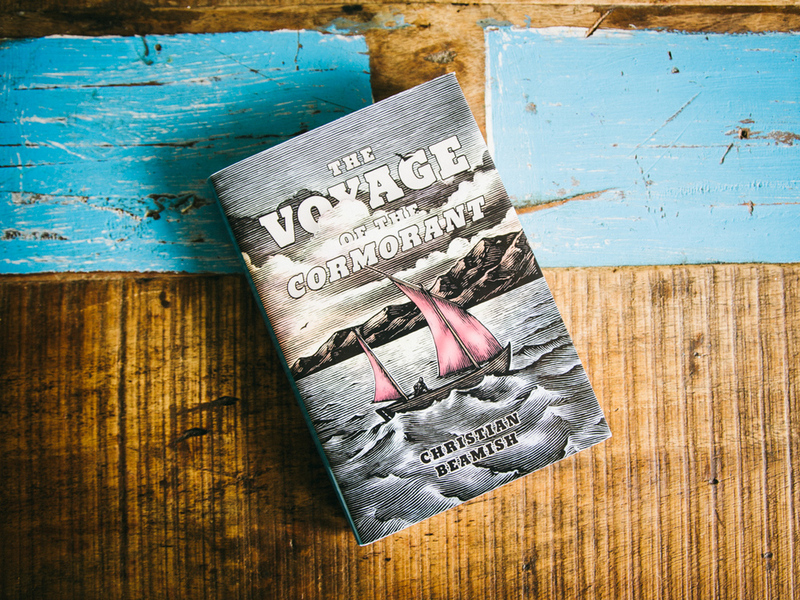 I wrote Voyage of the Cormorant in three months sitting at my desk each day in San Clemente in the cottage I rented after I’d returned from Baja and an ill-fated sail on Vancouver Island. 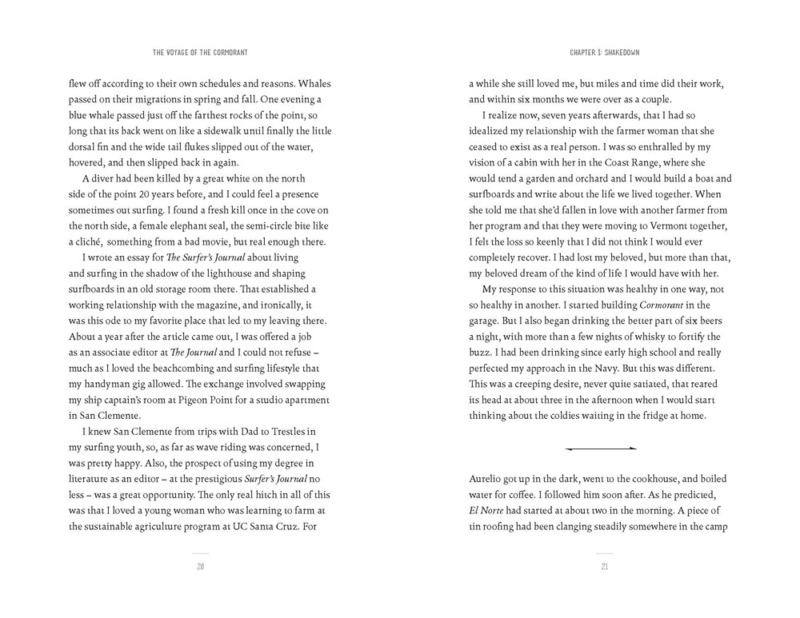 Of course, if you consider the two years I spent building Cormorantand the two years I spent learning to sail her—as well as the years surfing from childhood on and all my dreams about this mode of voyaging—then the book took considerably longer than three months to write. Not that it matters much how long it took anyway, but there was a quality of readiness to the undertaking. The ingredients were well-prepared, and the “baking” was a final, almost incidental step in the overall process. The six-weeks I spent at The Banff Center’s Wilderness Writer’s Residency were essential also, and I am grateful for the opportunity to have had that studio in the forest in Alberta, and to have discovered for certain that given the un-interrupted time, with all food and requirements for shelter accounted for, that I could work for twelve or fourteen hours at a go—indeed, that I was greedy for the time to sit with the words and puzzle out the story. Those six weeks provided me with the first chapter. Writing is not like sailing, except that it requires long hours of sitting. I suppose there are metaphorical similarities in the aspects of navigation, but writing is about choices of what to include, how much or how little to say about a given topic, whereas sailing, once one has left the shore for the open sea, is about dealing with the conditions at hand. I’ve received a fair amount of correspondence from people who have read Voyage, and virtually all of it has been positive, some of it very moving in the way my experience has touched someone else, made them rethink their situation—particularly how the disease of depression warps one’s view of the world and what is possible. For that I am humbled and have learned that what we say, especially in print, can have a real impact. I was back down in Baja two winters ago, down in the remote corners surfing again with a couple of buddies a few months before my wife had our second child. The track winds fifty miles across the desert, and when you make the bend that finally brings the ocean into view your eyes just drink up the blue and the sparkle of it, quenching a thirst you didn’t realize was so strong. But what hit me on the trip, six years after sailing that same coast in my little craft, was the vastness of the territory and the possibility of disappearing in it whether on land or sea. Everything changes when you come back, and I surveyed that view with new eyes that marveled at my earlier motivations—how strong my desire was then for solitude, how strong it is now for my family. My wife Natasha and I are on the most common and arduous of expeditions, raising our five-year-old Josephine and her 18-month-old brother Miles while holding to some semblance of a life in nature and surfing. Digital screens play a bigger role in our home than I am comfortable with, but we snuggled down last night and watched E.T. with Josephine and that was pretty fun so perhaps it’s the extent to which I am so comfortable with screens that concerns me. It’s nothing a few days out at the islands wouldn’t fix, sleeping under the canvas again, making that crossing in the old way, under the press of sail alone. I like the idea of a free-range family life—entire seasons in Baja, weeks and weeks on the boat combing the shore, wilderness immersion. But we have to make a living, even if our shelter for the past four years has been a modest 450-square-foot house. And we want Josephine to go to school, which she does, swinging on the monkey bars with the best of them, so the wilderness shores await. Living in Carpinteria, California is a long way from the concrete jungle as well, so we bide our time with Sundays on the quiet beach out front, or some wave riding over at the Rincon when time allows. This house we rent, tiny as it is, wedged between the front house and the back gate, has two patches of soil on either side of the front walkway and lies not 200 steps from the salt marsh and estuary on the West end of town. It takes a few minutes to walk to the ocean, and from the threshold at the front door I can see the ridgeline of Santa Cruz Island across the channel. Natasha, daughter of a cinematographer father and an artistic/entrepreneurial/punk-rock mother in Hollywood, comes from a long line of gardeners reaching back in time to Hungary and Armenia, and she transformed those two humble patches of soil and made them a moving palette of vegetables and flowers, set off by trees in wood boxes, more plants and flowers in Talavera pots near the front door, and even a lily pond with fish and taro growing in another big glazed pot by the fence. In short, she has made this shoebox a home. She conceived, gestated, and birthed Miles here too, just as she did with Josephine in the house in San Clemente where I wrote Voyage of the Cormorant. So indeed I have embarked on a new voyage since my little experiment aboard Cormorant. And I still have the boat, which sits on her trailer at the end of my street at my neighbor’s place, ready to launch right off the beach. We had a magical sail two months ago before the surf season started, shoving off through the gentle wavelets and heading out to the reef at the top of the point here in town. The water was exceptionally clear, the kelp forest swaying like trees on land, Josephine and Miles in their lifejackets clutching the gunwhales and peering down as we ghosted across under oars as if flying. Natasha said she had never seen Garibaldi, the thick golden-colored fish that are the State fish of California, and as if on cue, just as we met a rise in the reef where a rock ledge provides cover, three of them swam in lazy circles below us. Josephine wanted to put her wetsuit on and snorkel the reef, so we did that together and I gave her her first lesson in the art of the kelp tie to keep the boat from drifting off. The lightest of breezes came when we pulled ourselves back on board, and I put the sails up, steering with an oar to avoid tangling the rudder in the kelp, and we glided in, home in time for lunch. This little boat Cormorant, 18-feet of Shetland Island curves and Norse-boat lineage, has been a vehicle of dreams. And this book, Voyage of the Cormorant, but one installment in an ongoing story of ocean involvement. But I love this story—the people I’ve met, the wildness I’ve encountered—and the book stands as a piece all on its own I think too. I’ve drawn up plans for a 27-footer based on what I’ve learned about simplicity and the utility of traditional designs. I’d thought to have had this boat built by now, but anyone playing the child-rearing, career-tending game will understand that the time has not been right. Still, I’ve laid out a building frame and the molds for the 27-footer, and also bent the inner stem for the bow, so I have begun. More work needs to be put into getting the bottom curve right, and there is the question of funding, but I envision Josephine and Miles helping me in the years ahead. Then again, children and power tools are probably not the best combination. All’s well though, because if I’ve learned anything from these voyaging days it’s that we get just what we need—in time. I used to sketch the outlines of surfboards I wanted to shape on notebook paper before doing a layout on the foam blank at full size. These were not scale drawings, but roughly proportional nonetheless — just something to transfer the general idea from my mind’s eye into semi-tangible form. Having developed a good set of templates over the past 15-years or so, as well as a general sense of the dimensions that produce the curves I like, I don’t resort to the pencil and sketch pad as often as I used to for surfboards. But I’ve started building a 27-foot sailboat, and well before I secured a single post for the building frame, or built a jig for the bow stem, I put on my naval architect’s hat and carefully laid out the lines at 1:3 scale, with frequent reference to the book, Yacht Designing and Planning (1936 W.W. Norton & Company), by the great American boat designer and historian, Howard Chapell. “‘[B]oat sense’… obtained by critical observation and comparison of lines and details of successful craft,” Chapelle writes, “is of far more importance than either the ability to make difficult calculations or to draw well.” And that’s a good thing, because while I might draw reasonably well, and can even work out the dimensions for the building projects I undertake, my “boat sense” — gained from the surfboards I’ve shaped and ridden, the boat Cormorant I built and sailed to within an inch of my life, and the many, many vessels I’ve inspected — is far superior to the more mechanical aspects of boat design and building. Simply put, I have a clear idea of the boat I want based on a solid understanding of the design features that make it so. This boat, Spirit Level, (named for the book by Irish poet, Seamus Heaney) is a Viking Riverboat Channel Crosser, with a balanced lug for the mainsail (like Cormorant’s main) and a gaff rig mizzen — an ancient and efficient sail plan borrowed from boats of the 18th and 19th centuries. Built for coastal cruising in the Southern California Bight from Point Conception and across to the Channel Islands, as well destinations further North and South, Spirit Level will be a family sailboat with a small cabin and diesel motor for auxiliary power. 27-feet LOA, with a beam of 8’6”, Spirit Level is to be built in marine plywood lap-strake planking secured with epoxy, and re-enforced by laminated interior frames. The masts will be un-stayed and removable, fit to chocks when underway with the mainsail halyard run to a block on chain plates on the weather rail for added structural support. Leeboards will provide lateral resistance (think Dutch river barges), and keep the cabin space uncluttered. The trick to building anything, of course, is getting one’s hands to draw the lines and make the cuts that the mind’s eye conjures. Because the points, lines, and curves of a surfboard or boat exist in theory (or on a plan), we have only to fix these in space with the materials of our choosing. To be sure, certain dimensions represent what could be called “cosmic coordinates” — the foils that allow flight, or exceptional hydrodynamic performance, for example — and although it is a lifetime’s work determining the best lines for either boats or surfboards, a trained eye knows when it sees correct proportion. There is a resonance, or harmony to well-designed objects, and throughout the build — no less in setting up the molds (the interior shapes of the hull over which the planking will be laid) than in choosing the roofline for the cabin top — the eye will inform the dimensions that ultimately define Spirit Level’s form. I sought to continue in the way of "Cormorant" building and scraping and saving my way to epic surf adventures en famile. However, I have not been able thus far to make this vision of a 27-foot sailing vessel a reality. We are often encouraged to pursue our dreams, no matter how difficult or impossible they may appear. Indeed, it seems the only path to "greatness" is the one an individual blazes for him or herself, and the idea that we can build our lives just as we want them, sustained by the activities that speak to our hearts, is a powerful and valuable one. But what if we cannot pull that off? Does the fault lie merely in a lack of belief in our vision? I have long now seen that a major boat construction is not going to be in the best interests of my family. I am a working man now. I have built the shaping bay at our place, and there I create ocean craft in the form of surfboards. And I write. But this big vision, this boat with a snug little cabin, seems to have slipped from my grasp. I suppose it is not the only thing I want, or perhaps I do not want it enough to go through (and put my wife and children through) the grind and the tear of manifesting this particular reality. Although as I write these words I think to myself it doesn't sound so bad, really—a curve here, a bevel there, some plywood and epoxy and I'll see you at the islands! This is not a manifesto of failure, but my fancy video and self-promotion regarding the "Spirit Level" project rankles a bit, because the truth is the moulds for the hull and the inner stem for the bow lie stacked against the shed and I have no immediate plans, nor any in the foreseeable future, to build this boat. My boy turns three next week. and my girl is but six-years-old. I go to work and come home to this beautiful house and try mightily to keep my mind on happy and productive paths. Surfboard shaping is a grand art and that is my building/designing joy currently. This raising a family business is a smorgasbord of every difficult, maddening, joyous, mundane and wondrous aspect of life. And it is the life I have created along with my wife Natasha, and it is full, and I am fortunate, and within it still I may be able to build that next boat after all. 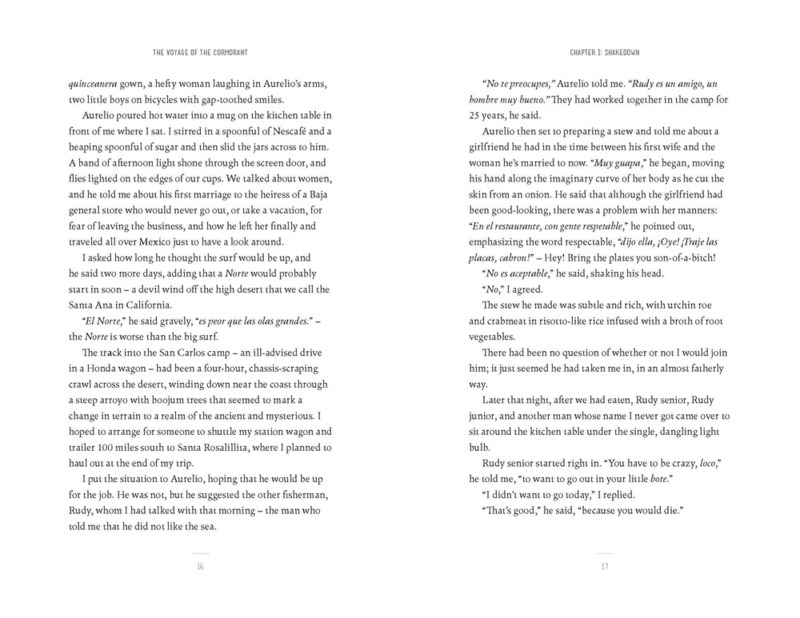 In the meantime I'm seeking the way to share these layers of experience in words in another book to be a companion to "Voyage of the Cormorant." Steeped in the Brew (The Surfers Journal) Click here to read. Soundings V (The Surfers Journal) Click here to read. Soundings: Acute Angles (The Surfers Journal) Click here to read. 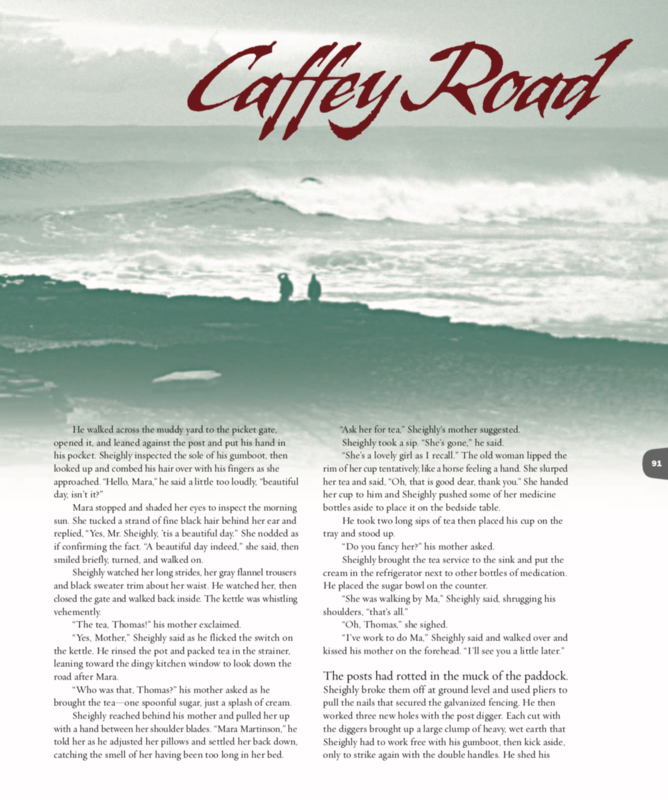 Gaffey Road (The Surfers Journal) Click here to read. 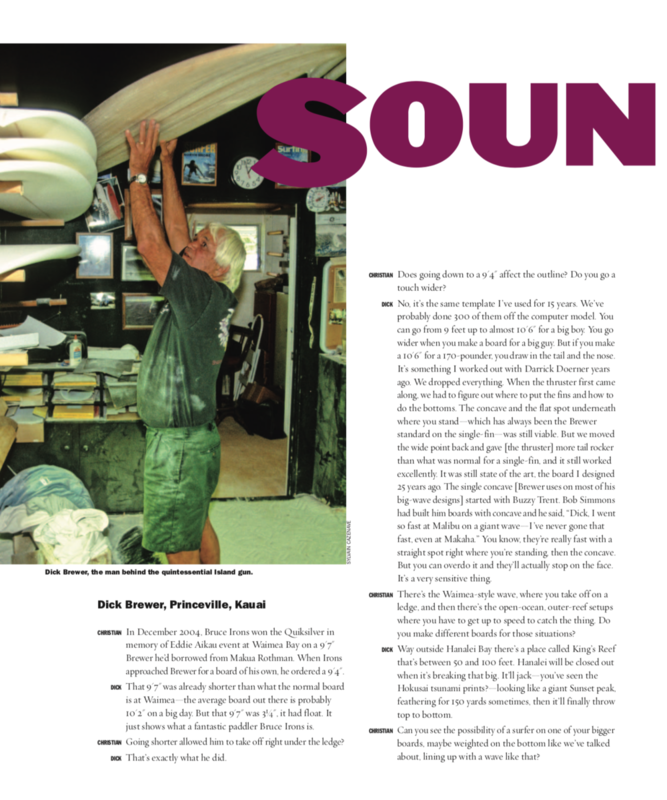 Soundings IV with George Greenough (The Surfers Journal) Click here to read. The Lens: Meditations From a Distant Shore (The Surfers Journal) Click here to read.